Amid volatility in the stock and money markets, the four letter words, ‘Risk’ always associates with them and drive you away from the stock market and lands towards bank fixed deposits which are safe-haven at all the times. These days bank fixed deposits are giving better returns than mutual funds and fixed maturity plans(FMP) in short term, say for 3 years or 5 years. But, it does not mean that bank fixed deposits do not involve any risk. One of the risks you carry is that of reinvestment. It means you are unsure whether you will be able to reinvest the amount at the same rate or a higher rate when the deposit comes up for renewal. This is a risk where, every investor has to live with in every fixed income product whether it is bank deposits or bonds etc. Read Also: How can go for Company Fixed Deposits Schemes? Generally, most of fixed deposit investors have been trying to time the market. They wait for interest rates to peak before locking their deposits. They intend always to lock the plenty of their money at the highest interest rates. But they lose out on returns, since, in the interim period, they may see money lying idle in their saving bank accounts, earning lower returns. Even if, they have end up at higher rate, there is no guarantee that they will be able to reinvest that sum at the same rate of return.If deposit rates go down after five years which are the most likely, you will lose out on interest income. Worse, if interest rates rise during that five-year term, you will lose out on the higher interest you could have earned on sums invested later. Clearly it could be a catch 22 situation! Either, you have to break your fixed deposit and end up paying a penalty or have to accept the prevailing rates at that point of time, whatever they were. In this scenario,what you need to do is to form a strategy for the long term, just like equity, you cannot keep only one stock in your portfolio; in debt too you cannot depend on only one instrument. To mitigate risk, you need to invest across available instruments and of different tenures. Typically, a ladder is setup to have one product mature at the end of every year, which is reinvested back depending upon the period. The maturing product gives you an opportunity to invest again, depending upon the then existing interest rate scenario. You can use it with products like bank deposits, company deposits, post office schemes, bonds and fixed maturity plans of mutual funds. It is a technique of creating a staggered income ladder, one rung at a time. Let’s take a close look, how it works. Suppose, you want to invest lump sum of Rs 5 lakhs in a five year deposit. 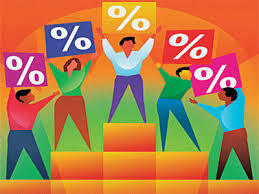 You are not sure which way the interest rates would be heading in the coming years. If the interest rates go up, your investment will be locked at your current rate and you could not get benefit from the higher rates. On the other hand, if the rates were to go down you would be more than content to have the money locked in at higher FD rates. So, you have to create a five year simple ladder as you break it up into five equal parts of Rs 1 lakh each. Then invest one block in a one-year deposit, another in a two-year deposit, and so on till you invest the fifth in a five-year deposit. But, you cannot reach the fifth rung without climbing the first four. A year down the line, the one-year deposit will mature and it can be reinvested in a five-year paper to create the sixth rung. When the two-year deposit matures, it can be reinvested in a five-year deposit to create income in the seventh year. Read Also:Are your Fixed Deposit Returns axed by TDS? Similarly, you can also create a simple ladder in the investment of NSCs for a 5-year period and requires a minimum investment of Rs 100. There is no maximum limit for investment. Let’s assume for the purpose of saving tax that as a part of your debt portfolio, if you need to buy NSCs worth Rs 60,000 in one financial year, instead of buying in one shot, you can buy NSC worth Rs 5,000 every month. After five years, when the NSCs you bought in the first month mature, renew them. Repeat the renewing procedure for the following months. Continue these purchases until your retirement. Once you hit the golden years, the matured NSCs will start yielding regular inflows as pension. The same objective can be achieved through suitable term deposits too as outlined above. So, you can see that when you create ladder in your fixed income instruments, there will always be some amount of money that will mature every year or after the intervals you have planned, every six or even three months, for instance. This gives you access to funds in an emergency for an indefinite time period. The amount received on maturity every year can be reinvested to lengthen the ladder. Laddering your instruments helps you to commit to a longer term, while retaining some degree of liquidity. Since term deposits usually impose a penalty on premature withdrawal, often the benefit of breaking a deposit before its term expires and reinvesting it in a higher return deposit is lost, at least partially. Besides, redeeming before maturity can be expensive, and difficult, in some instruments like NSCs etc. On the flip side, in a rising interest rate scenario, laddering may not give you an interest payout as high as you would have got by investing the entire sum at the higher rate. But the upside is that if interest rates fall, the overall return on your corpus will still be higher than the prevailing rate of return as there will be tranches invested at higher rates. So, over the longer term, the flow will be more even and predictable. Typically, the higher the risk, the higher is the return, and since you will be mitigating some of the risk, it would bring a slightly lower return. Laddering is very useful for retired people who depend on interest income to meet their day to day expenses. Laddering can free up capital as and when required. It can also be built for those who have short term goal such as for any big purchase and vacations at regular intervals. As a long term investment, Laddering will give you an average return and help you prevent your corpus from maturing at the lowest interest rate cycle. This concept of laddering applied to FDs is very similar to the concept of SIP (Systematic Investment Plans) applied to mutual funds or stocks. How can go for Company Fixed Deposits Schemes?